In CPM we support and encourage the professional development of our people. All the members of our team possess the CPM mentality, which could be defined as highly experienced and motivated people, nice to work with and passionate about what we do. A perfect example of progression within CPM and our driven result attitude is Catherina Grace, a member of our Recruitment team who is leaving the company to pursue an even bigger step in her career. Catherina has been working for CPM since 2013 in the Recruitment department, where after a 3 months internship she got a permanent job. She remembers that during her internship she was asked to do a lot more that photocopying and scanning. Instead, she was involved in core HR activities: “The HR Director had me working with competencies framework, in policies, discipline, recruitment... She had me working everywhere”. Catherina claims that this opportunity to understand how an HR department is operated was a key factor for her to step up in her career. But Catherina’s history with CPM starts even before, when she worked for Eircom in a Door to Door sales role and later progressed in Business to Business, but when she had her daughter she decided to resign. She perceives that this previous experience in field sales helped her to become a better recruiter because she already knew the competencies that are necessary to succeed in the sales sector. In that sense, Catherina states that for a recruiter is fundamental to know the industry, the attributes and skills that are needed in order to progress in the career. Also she advises to use Social Medias like Linkedin in order to attract more candidates. On December, Catherina won the Maggie Award, which is considered to be the most prestigious of all CPM's recognition, whereby is highlighted outstanding performances across all measures. Also, she won an internal competition for CPM blog with her post “Garda Commissioner Wanted: Please apply here” about the Holistic Interviewing approach. - What do you like the most of working in CPM? Is the esprit de corps. Is that everybody comes together, it doesn’t matter which department they are working in, everybody wants to help everybody out. There has been times when I have run into Finance, and there has been times when Finance has come over to me in order to help me to improve my skills. Is that team spirit. Nobody has the mentality of that is not my job. Everybody pulls together in order to deliver the objectives. And the senior management team are very supportive in all of that, they are very approachable. - How did you get along with the tough days in CPM? The tough days in CPM are not all set but the victories that you get or the successes. The tough days are made less tough because of the team that you are working in. Working within the department that I am working in, we all know that we have tough, pressurize stress days and there is always one person to just lift the others up. If you come in and you are stress, they are going to put a smile on your face and they are going to make you realize why you enjoy doing the work that you are doing. - As a recruiter, what advise can you give to the candidates that are going to have an interview? Know the job they are going for. Read the job description and the ads. When we put an add up for a role we are telling candidates exactly what it is that we are looking for. So don’t just have one generic CV and apply for everything in anything. Keep a track record of what you are applying for, because when the recruiter rings you and starts speaking to you about the job, you want them to feel you are interested only in this job. So don’t ignore the job add and just see “sales person” and apply for it. Know what they are looking for, previous experience, so if you have previous experience highlight that and relate all back to your experience. - What learning do you take from CPM? I would say 2 things. The first is time management. Because I am a people pleaser and I want to do everything for everyone, I learned that I needed to be able to prioritize. That sometimes I have to say no, or sometimes I have to push back and say “I can’t deliver it at that time, but I can deliver it at a later time”. So time management was very important. Knowing what my capabilities were and what I can deliver. And the second is accountability. Being able to know my accounts inside and out. So any time of any day I knew exactly how many candidates, where they were based, what skills they had, where they ranked. That type of accountability, to really have attention to details on that, I had to develop on my time on CPM. Ambitious, supportive, developing and proactive. 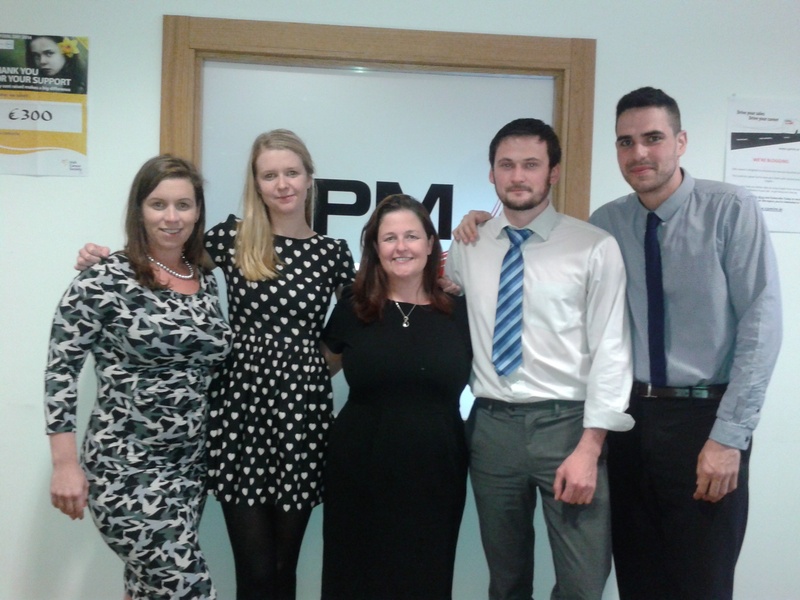 All the CPM team wishes Catherina the best in this new step that she is taking on her career!